Der geheime Krieg konzentriert sich auf SWIFT, nachdem George Bush sen. hingerichtet wurde. Die USA haben sich gewehrt, indem sie den Regimewechsel in europäischen Ländern erzwungen haben, die versuchen aus SWIFT aussteigen, daher (teilweise) auch die Probleme in Frankreich. Since the death of Nazi Fourth Reich Fuhrer George Bush Sr., the battle for control of the world’s financial system, and thus of the process of deciding humanity’s future, is now centering on control of the SWIFT international interbank electronic transfer system. A final battle is taking place between the 13 bloodlines which have traditionally controlled the planet, and the meritocratic Gnostic Illuminati who control the U.S. military-industrial complex, multiple sources agree. The battle is heading for a climax of sorts now that George Bush Senior has been “executed,” as confirmed by both Pentagon and CIA sources. Chinese Freemasons previously admitted to this writer that they had invested heavily in getting Hillary Clinton elected as U.S. president because they had been promised a “United States of China,” including ASEAN, the Korean Peninsula, and Japan. U.S. military intelligence also has confirmed to us previously that George Bush Sr. provided China with the technology needed to accurately guide their nuclear missiles. The purpose of the Clinton/Bush transfer of military technology to China was to make China more equal militarily with the G7 so that their planned “Gog versus Magog” end-times war would be sufficiently destructive to result in their planned artificial end times. Instead, the religious fanatics behind this plan are going to face military tribunals “starting in January 2019,” Pentagon and CIA sources confirm. To prepare for these tribunals, Pentagon sources say “Army Chief General Mark Milley was named as the next Chairman of the Joint Chiefs of Staff to provide continuity and protect Trump into his second term.” “This announcement was made unusually early to send a message to the Deep State, as the previous JCS Chairman was Army, and Army was chosen again over Air Force and Navy,” the source continued. Air Force and Navy brass have been heavily implicated in the planned World War III, which is why they are missing their turn to run the entire JCS, Defense Intelligence Agency sources note. understand what sort of world changes the U.S. military government is hoping for, let us take a look at what U.S. Secretary of State Mike Pompeo said in a speech delivered at the German Marshall Fund on December 4, 2018. Later in his speech he made it clear that current international institutions like the World Bank, the IMF, the EU, the UN, the African Union, and the Organization of American States were all failing and needed root and branch reform. 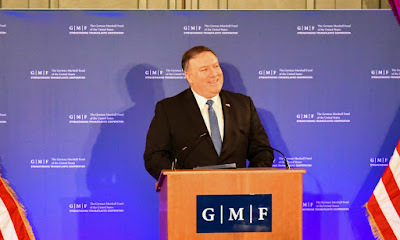 However, Pompeo’s proposed solutions—to imitate what Trump was doing in the U.S. and to reassert the power of nation-states and of U.S. leadership—fell far short of the mark when it came to offering solutions to problems faced by the Western world and the planet as a whole. He did not, for example, mention that the current financial system, controlled by a few interbred families, has devastated the middle class in the G7 and created huge gaps between the rich and the rest even in places like China. The situation is now such that 0.1% of the population controls more wealth than the bottom 90% of the population, and yet Pompeo did not propose a reset or jubilee to correct the situation. Nor did Pompeo mention the fact that humanity has wiped out 60% of animal life since the 1970’s or offer any sort of solution. The U.S. military government’s fight against the bloodlines, though, is far from over. Getting back to Pompeo’s speech and the top of this article, we note he said: “America intends to lead—now and always. For example, here in Belgium in 1973, banks from 15 countries formed SWIFT to develop common standards for cross-border payments, and it’s now an integral part of our global financial infrastructure. SWIFT recently disconnected sanctioned Iranian banks from its platform because of the unacceptable risk they pose to a system—to the system as a whole.” What he was alluding to here is a European (bloodline) and Chinese effort to get around U.S. SWIFT sanctions by setting up an alternative international payments system. That is still happening, with countries like India, Russia, and China dumping SWIFT in order to end U.S. control of the international financial infrastructure. It is also worth noting that the Abe government last week passed a law allowing Japan’s water resources to be privatized and presumably sold at a discount to Veolia, a company controlled by the French branch of the Rothschild family. Also bear in mind that Softbank CEO Masayoshi Son has been offered at least $45 billion by Israeli (Rothschild) stooge Crown Prince Mohammed bin Salman. Anyone want to bet on Son?